At De St. Germain Law Office, our lawyers are dedicated to representing Slidell families in all of their family law needs. Whether you are facing a difficult decision or are planning for the future, our Louisiana law firm is here to represent you in every season of life. We are a boutique family law firm, and we strive to build long-lasting relationships with our clients so that we can serve your needs both today and many years down the road. From custody concerns to estate planning resources, the lawyers at our law firm provide the support and guidance you deserve and the experienced family law counsel you deserve. 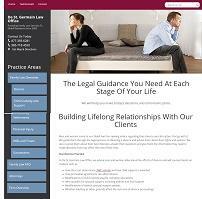 Our lawyers also have a background in business law, which gives them a unique perspective and comprehensive understanding of complex family law and divorce-related issues such as division of business, real estate and assets. We also help our clients plan for the future in order to ensure their families are protected in the years to come. At De St. Germain Law Office, our attorneys can help you with successions, trusts and wills. By taking the time to get to know our clients personally, we will become your trusted legal confidants for all of your family legal needs.